Our 17-year-old daughter wanted to make her Dad homemade ice cream last weekend for Father’s Day. We love anything tropical and with coconut at our house. Flipping through my ice cream cookbook, she decided on this. It was absolutely delicious! There is just something about homemade ice cream that is a perfect ending to a summer night. Preheat the oven to 400 degrees. Spread the coconut on a baking sheet lined with aluminum foil. Place in oven and toast coconut for about 5-7 minutes until lightly browned. Remove from oven and set aside to cool. In a medium bowl, bet the sugar into the eggs until the mixture is thickened and pale yellow. Add the cornstarch and salt and beat to mix well. Set aside. In a heavy medium sized saucepan, combine the ½ and ½ and the coconut milk. Bring to a boil over medium heat. Remove from the heat and slowly beat the hot mixture into the egg and sugar mixture. Pour the mixture back into the saucepan and place over low heat. Whisk constantly until the custard thickens slightly. Don't let the mixture boil or you will have scrambled eggs! Remove from the heat and pour the mixture through a strainer into a large bowl. Allow the mixture to cool slightly and then stir in the toasted coconut, cream and vanilla. Cover and place in the fridge until cold or overnight. Remove the chilled custard from the fridge and stir. Stir in the coconut rum if you are using. Freeze in 1 or 2 batches in your ice cream maker according to manufacturers directions. When finished, the ice cream will be soft, but ready to eat or place in a plastic container and freeze for a couple of hours for firmer ice cream. Garnish with additional toasted coconut if desired. Coconut is one of my faves too…especially when it’s toasted! 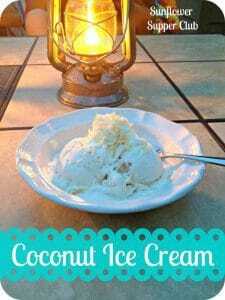 What a perfect time of year to list your Coconut ice cream…..heck any time of year sounds good for this. (mouth watering) Thank you for sharing with the Clever Chicks Blog Hop this week; I hope you’ll join us again!